Have you ever had a band make you angry – like really angry – in a good way? I hate feeling like I’m missing out on something. Popping in the first full length album by Captain Horizon and casually perusing the review section of their website, I am met by article after article about how amazing this band from Birmingham, UK is. Granted, the band could be putting up all the decent press and it could be a skewed view. Part of me doubts it, given what I’ve heard from The Lights of Distorted Science. Immediately, I am popped in the teeth by a throwback rock album with sausage fingers and an oversized pinky ring. But what is it a throwback to? Is it Queensryche, you know, when they were good? Is it mid 90s post-grunge/nu-metal? Is it the hard rock to pop crossover that reared its head and took a bite out of the radio waves a decade ago? Great question(s). The answer is “yes.” Just know that as someone who turned 12 in 1991, 1990s and 2000s alt-rock could not be more in my wheelhouse. I built the boat, put the wheel in, and sat in the house steering this ship. I may not know where it’s going, but I have an idea of where it has been. Captain Horizon knows all the tricks of the trade to make me nostalgic for some good old-fashioned rock ‘n roll, but does the concept equal execution? I think you might already know the answer to that one. Guitarist Joshua Watson runs the gamut of wailing solos, crunching power chords and deliberate finger-picking – even a little Spanish guitar in ” The Sun Has Set.” Alex Thompson ventures between plodding bass lines and angry riffs in “Shell” and “Light Years” that make a former bassist well up with pride while Drummer James “Mez” Merrix does all you can ask: setting brisk rhythms off the jump, off-tempo pace in “Torn Up My World”, and entertaining fills. At the root of it all, Steve ‘Whitty’ Whittington belts out some serious rock vocals. And I am nothing if not a sucker for some bombastic, soulful lyrics. All of these descriptors could make Captain Horizon sound like they are nothing more than a revue of 20-plus years of rock. There are times that it is difficult to separate the band from their influences. A debut can be about showcases your strengths as a band, and they have a lot of rock ‘n roll on their sleeve, but this debut has moments that come across as an audition. It feels like the four showed their mettle and are now waiting for an invitation to the dance instead of kicking the door down and forcing others to notice them with an original sound. So listen to Captain Horizon, tell your friends to listen to Captain Horizon. Their debut came out on December 10th. Help speed along their status of not being just a great live band you may or may not have heard of. If nothing else, get them to the states so I can stop being so angry. One of the biggest strengths an independent band can possess is the ability to stay consistent in their sound while forming a dynamic style. It is a fine balance to keep things tight while slinging riffs and an array of vocals to the far reaches of your ability. The unsigned Birmingham-based quartet Captain Horizon is a tilt-a-whirl of Alt-Rock that baffles my ears track after track. Just when I think they fall flat, I find it is an elaborate ploy to convey what a lot of bands miss; meaning. The recently released The Lights Of Distorted Science packs a plethora of passionate Alt-Rock into twelve well thought out tracks. Bringing us into their world with “Light” we are greeted with Alex Thomson’s fiercely present bass, and James “Mez” Merrix’s rolling beats. Shortly after, we meet the talented licks of Joshua Watson and the unique voice of Steve “Whitty” Whittington. By the end of the first track it is clearly obvious that this is not some band out to just make music. Their sound is well thought out and played with serious passion. Each piece of Distorted Science plays well to the whole, but my god, even as individual songs they are some serious rock. “Patch” reiterates the body moving rock via a heavy opening bass lick. “The Sun Has Set” plays to a very real emotion through sound clips of historically significant moments. “Pious” revels in a more acoustic feeling. “Shell” will tear you up with a hard rock personality. There is clearly a little bit for everyone and a whole lot of Captain. Capping off The Lights Of Distorted Science we find ourselves in the “Underworld;” coming in at just over five minutes, the ballad driven finale seals off the record by finding the sweet spot in their melodies and drifting instrumentals. 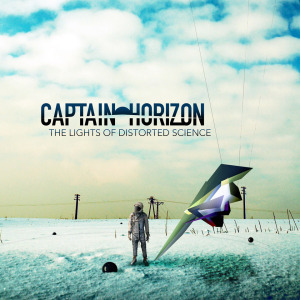 Original in their talents, Captain Horizon lands safely in the rock world with The Lights Of Distorted Science. Whitty’s vocals standout with originality, Mez keeps a tight control on some seriously dynamic range, Watson shreds precisely when he needs to and I haven’t been addicted to bass like this since Jared Followill. Captain Horizon has accomplished something unique; they explode to the far reaches of their talent without blowing out; they have harnessed lightning in a jar. This entry was posted in Reviews and tagged Alt, Birmingham, Captain Horizon, music, nanobot, review, Rock, The Lights Of Distorted Science by Clay. Bookmark the permalink. Hey guys, thanks so much for those kind words and I’m so glad you get what we adore.